The next time the Pensacola Police Department is faced with locating a missing child or diffusing a hostage standoff, officers will have four new high-tech drones at their disposal. The drones — two indoor and two outdoor — were custom built by scientists at the Institute for Human and Machine Cognition in downtown Pensacola and delivered to the department in January. Four officers have already begun working with the drones and receiving FAA-certified training on the new technology. “Police work is incredibly dangerous and difficult,” Police Chief Tommi Lyter said. “You have to turn that corner, and you don’t know what is on the other side. In August 2018, scientists at IHMC teamed up with Lyter to help his department develop an ongoing drone program. The idea, he said, is to build a sustainable program that will change and expand over time along with the leading technology. Lyter, whose law enforcement experience includes SWAT and K-9 work, believes the drone program is well worth the initial price tag of $50,000. IHMC Research Scientist Matt Johnson, who headed the drone team, said the innovative partnership is a long-term collaboration. “It’s wonderful to get to work on technology that you know has the potential to help somebody,” he said. Lyter has enjoyed watching the IHMC scientists in action. 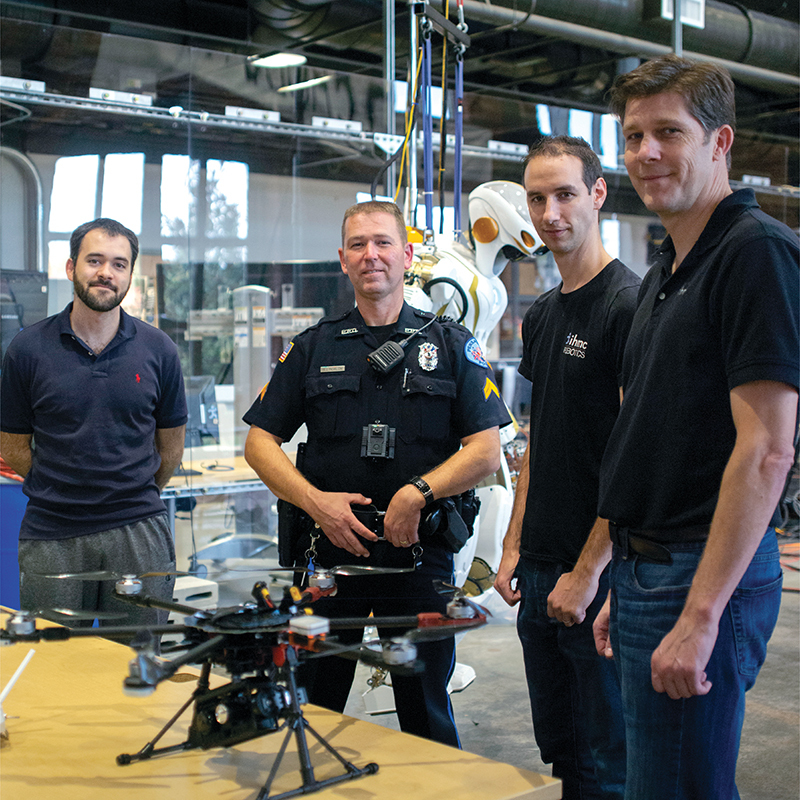 The new technology will allow officers to assess some emergency situations far more quickly, said Patrol Officer Robert Lindbloom, one of the first four officers who was selected to work with the drones. Lindbloom, who spent 22 years in the U.S. Air Force as a helicopter pilot, said he envisions the outdoor drones being especially helpful when the department is searching for an endangered person or suspects who have fled on foot or trying to assess an unruly crowd or mass casualty incident. Johnson agreed, noting that the two outdoor drones — which are hexacopters with six propellers — are also equipped with infrared cameras with the ability to pick up heat signatures. “All human beings will basically glow,” he said. The two indoor drones, which are roughly the size of a dinner plate, will be particularly useful in close quarters, Johnson said. “One of the neat features is the payload will be flexible in what it can carry,” he said. The indoor drones could be used to deliver a cell phone into a hostage situation or barricaded suspect to establish better communication, to search a damaged building after a disaster or to search for people hiding or trapped inside a structure. Instead of sending in an officer as the first contact, an officer could remotely pilot the drone to scout out the situation. Unlike the outdoor drone, which is operated via line of sight, the smaller indoor drone has protected propellers and delivers what’s called a first-person view. Under the department’s initial plan, one officer per patrol shift will be proficient in drone operation while the other drone operators will be on call if needed. “Once you have it is when you really start to realize what it’s good for,” Johnson said. “We’re excited to get them into their hands. While good eyesight and spatial awareness are important, he added, sound judgment is perhaps the most important qualification for being a good drone pilot. After completing initial hands-on training with the officers, Johnson and his team will be on hand for questions and consultations.